It's safe to say I always buy too many bananas when doing a food shop, when it gets to the weekend there is always two or three left, way past their best and looking extremely sorry for themselves. Not one that likes throwing away food, I always used to make the classic banana bread (recipe passed down in my family from my Grandma) but after spying The Londoners - Nutella Swirl Banana Muffins I knew I had to give them a go. After looking in the cupboard and realising I may not have quite enough Nutella as required (one too many trips with the spoon, obviously), I then caught eye of the peanut butter - looking unloved as it hadn't been used in a while, and I had a lightbulb moment...and so 'Banana, Nutella and Peanut Butter Muffins' were born. And they were good. 4. Tip the flour mixture into the egg/banana mixture and gently fold together. Again, lumps are good, just make sure everything is mixed well. 5. Divide the mixture between the muffin wholes until they are about half to 3/4 full. 6. 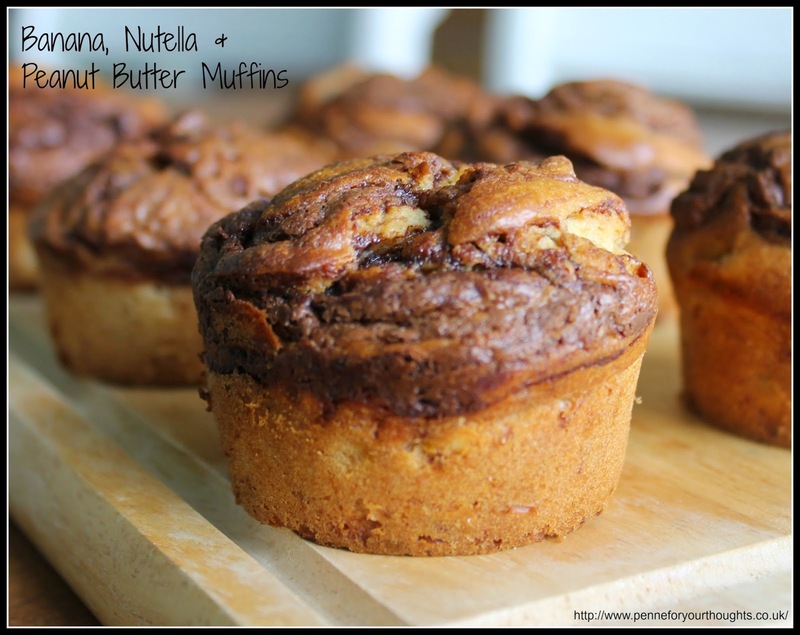 Take a teaspoon of Nutella, and a cocktail stick, blob the Nutella on top of each muffin and swirl. 7. Bake for 20-25 minutes until cooked through. 8. Allow to cool slightly in the tray before turning out and cooling further on a wire rack. I hope you all enjoy these as much as we did! Hello! You are very good at website design! This looks great, kudos! If you need help to register a business, do find the best business incorporation service today!